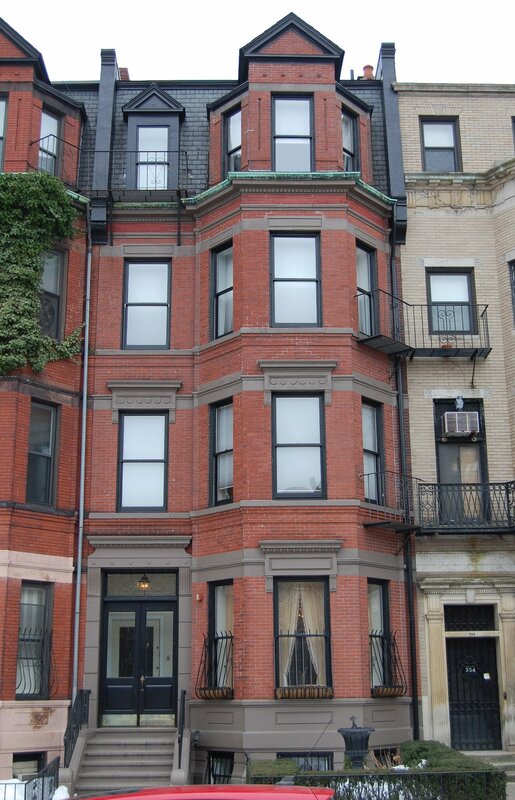 352 Commonwealth is located on the south side of Commonwealth, between Hereford and Massachusetts Avenue, with 350 Commonwealth to the east and 354 Commonwealth to the west. 352 Commonwealth was designed by Obed F. Smith, architect, and built in 1883-1884 by Vinal & Dodge, masons, for building contractor George Wheatland, Jr. for speculative sale. He is shown as the owner on the original building permit application, dated November 30, 1883. The house was originally numbered 350 Commonwealth until about 1889, when 328 Commonwealth was built and the houses to the west of it were renumbered. 352 Commonwealth was one of thirteen houses (336-360 Commonwealth) built for George Wheatland, Jr., by Warren D. Vinal and Charles A. Dodge on land owned by Charles Merriam and by Jacob Rogers. 336 Commonwealth was designed by George Avery, 338-340 Commonwealth were designed by Bradlee, Winslow, and Wetherell, and 342-360 Commonwealth were designed by Obed F. Smith. 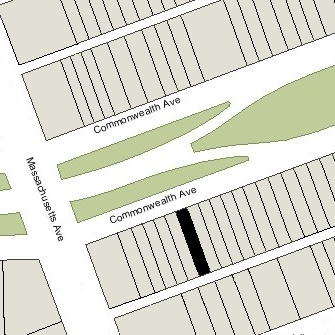 Click here for an index to the deeds for 352 Commonwealth, and click here for further information on the land on the south side of Commonwealth between Hereford and Massachusetts Avenue. On November 16, 1885, 352 Commonwealth was purchased from George Wheatland, Jr., by Otis Norcross Jones. He and his wife, Katherine (Kate) H. (Frost) Jones, made it their home. They previously had lived at 486 Columbus. Otis N. Jones was a partner in the firm of Otis Norcross & Company, dealers in crockery, earthenware, and pottery, and operators of a glass factory in Sandwich. The Joneses’ three children lived with them: William Frost Jones, Otis Norcross Jones, Jr., and Mary Ellen Jones. William Jones graduated from Harvard in 1892 and moved to Norway, Maine, where he became a lawyer. His mother was born in Norway, Maine, the daughter of William Frost and Lydia (Foster) Frost. Otis Jones died in May of 1892. In his will, he left 352 Commonwealth to his wife and the remainder of his estate in trust for her benefit and the benefit of their children, with her, Uriel H. Crocker, and George H. Crocker as trustees. Otis Jones, Jr., died in September of 1893 in Colorado Springs, a victim of consumption. Kate Jones and Mary Ellen Jones continued to live at 352 Commonwealth. On April 25, 1898, Kate Jones transferred the property to the trust established under her husband’s will. Mary Ellen Jones married in April of 1907 to Henry Clayton Metcalf, a professor of economics at Tufts College. They lived at 352 Commonwealth with her mother during the 1907-1908 winter season, and then moved to Winchester. Kate Jones continued to live at 352 Commonwealth during the 1909-1910 winter season, after which she moved to the Hotel Vendôme. On November 26, 1909, 352 Commonwealth was acquired from the trust established under Otis Jones’s will by Abbie E. (Brigham) Rice, the widow of Edwin Rice. She lived in New York City. The house was not listed in the 1911-1913 Blue Books. On April 10, 1912, 352 Commonwealth was acquired from Abbie Rice by Ernestine Arzilla (Houghton) Payne, the wife of Dr. John Howard Payne. They previously had lived in Brookline. John Payne was a physician and oculist, and also maintained his medical offices at 352 Commonwealth. On March 5, 1915, Ernestine Payne transferred the property into her husband’s name. John Payne died in May of 1927. 352 Commonwealth remained the property of a trust established under his will. Ernestine Payne continued to live at 352 Commonwealth, joined by 1930 by her sister, Sarah Virginia (Houghton) Ricker Hall, the widow of Freeman Alonzo Ricker and of Henry Hall. Ernestine Payne continued to live there until her death in May of 1947. On June 3, 1948, 352 Commonwealth was acquired from the trustees under John H. Payne’s will by Bessie E. (Moro/Murachowski) Sisson, the wife of Harold Howard Sisson (Sisonsky), an insurance broker. They previously had lived at 91 Bay State Road. The Sissons occupied 352 Commonwealth as a single-family dwelling, but appear to have at least contemplated renting space to others. On August 3, 1948, Bessie Sisson filed an affidavit with the Building Department stating that they would not use the fourth floor “by ourselves or other tenants, except for the use of storage purposes.” This implies a lack of egress which would be required by a multiple family dwelling. Harold Sisson died in February of 1953. Bessie Sisson continued to live at 352 Commonwealth until about 1955. In March of 1956, she purchased and subsequently moved to 300 Commonwealth. On March 1, 1956, 352 Commonwealth was acquired from Bessie Sisson by Mrs. Marion B. (Oostdyke) White, the former wife of Orrin Francis Barham White. Prior to their divorce in the early 1950s, they had lived in Belmont. He was a singer on the radio. Marion White lived at 352 Commonwealth and also used it for two businesses: Luzier’s Cosmetics and Luzier’s Electrolysis. The legal occupancy of the property remained a single-family dwelling. 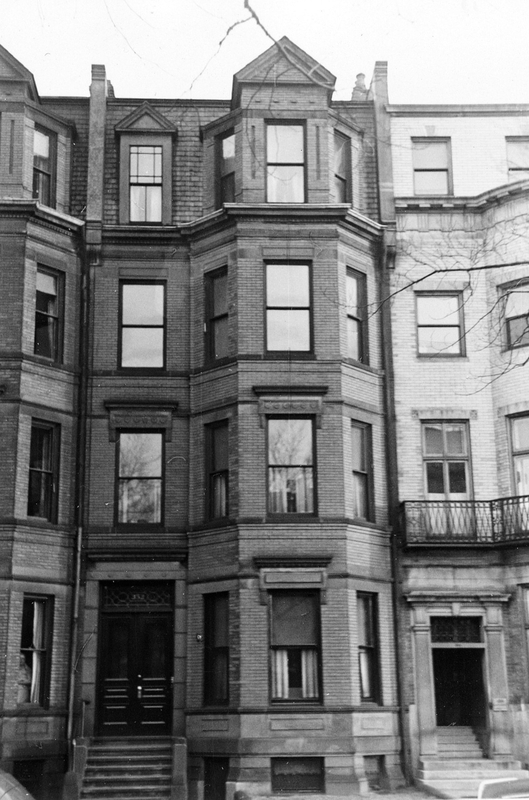 Marion White continued to live at 352 Commonwealth until her death in May of 1987. On December 15, 1987, 352 Commonwealth was purchased from Marion White’s estate by Joanna Gleason, trustee of the D & B Real Estate Trust. In February of 1988, Joanna Gleason filed for (and subsequently received) permission to convert the property from a single-family dwelling into four apartments. On December 15, 1987, she had recorded a master condominium deed to convert the property into eight units, and on August 25, 1988, she filed an amended master deed reducing the number of units from eight to four, The 352 Commonwealth Condominium.